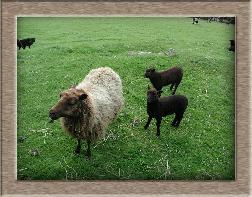 Black sheep are amongst the favourites within the farm. They are cute and cuddly. 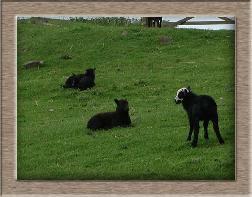 These lambs are a few weeks old and spend their time out in the field with their mothers. These two are totally black as is their mother. They don't stray far from their mothers side in the field, after all she is the local milk bar! This lamb is going for a drink of mothers milk, they will do this until they are a few months old. 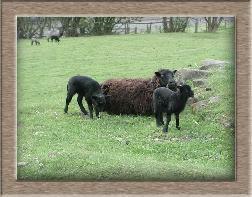 Two other black lambs with their mother, who is not as dark as some of the others. 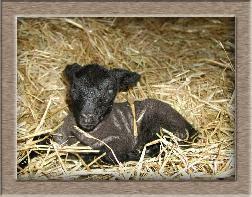 Many black lambs lose much of their black colour as they mature. Black Sheep are not very common on the farm, part of the reason may be that the wool is very dark and difficult to dye with all of the bright colours we use today. These two are sunning themselves on this warm day. 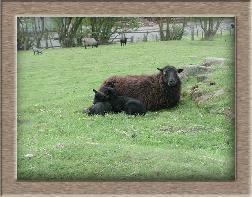 Mother is not far away though keeping a watchful eye on them. 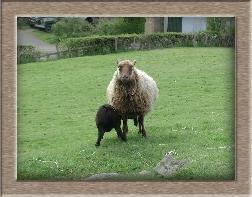 The mothers are very protective of the young lambs and do not let them stray very far. 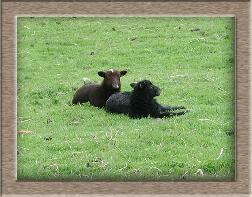 Three cute black lambs sunning themselves out in the field. 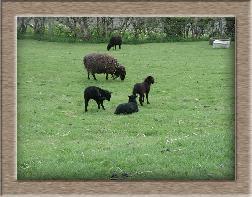 Lambs at this stage are just beginning to eat some grass but still like to take mothers milk. 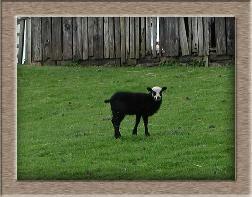 This lamb is particularly well marked being black with a white face. 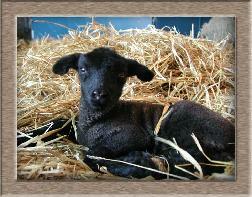 This black lamb is resting in the barn for a day or so before he goes out into the field with his mother. Another black lamb in the barn. Farmer Bob keeps them there for a day or so depending on how good the weather is outside. When they do go out into the fields farmer Bob checks them very morning and evening to ensure they have not wandered far from their mothers.